Listen to a clip from CD #1! Listen Laugh and Learn. Communication requires a number of different skills. In this part the skill of bargaining and negotiating is discussed. Enjoy the humorous examples and stories which help all of us understand what it takes to find solutions through communication. What You Didn’t Say. Pouting leads to more misunderstandings than any other communication. What you didn’t say is sometimes clear only to yourself. 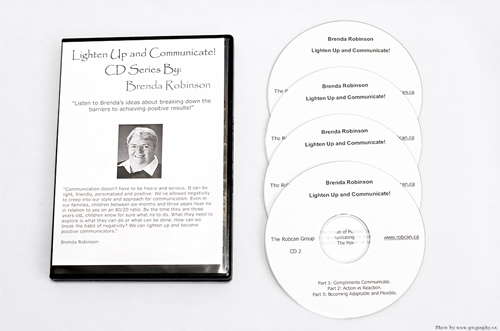 Laugh at yourself and with Brenda about the consequences of non-verbal communications. Nagging – A Skill. When we nag we deal with small problems before they become big problems. If we fail to nag about little things we often collect them and they become major issues. Nagging should be an important part of communication in any relationship. Take a light look at what happens when we keep ourselves from being nags. Action vs Reaction.When we hear negative words and phrases we prepare to defend our positions and/or fight back. This is reaction. Explore some ways in which communication can move situations into action. Learn the power of action words to move things ahead. Becoming Adaptable and Flexible. We can’t plan how others will communicate. Therefore we must be adaptable and flexible to respond effectively. The Power of Positive Communication. The words you use and the spirit in which they are spoken determines the response you will receive. Responsiveness is key and must include your tone, your actions, and your emphasis. Communicating for Quality Results. The media, the news and the entertainment world have increased peoples’ general expectations of how they will communicate and relate to each other. Delve into some of the skills which allow us to meet and even exceed these expectations. Be a quality communicator. The Power of Words When you choose your words carefully you impact those with whom you communicate. Review the “top 20” positive words and the “top 20” negative words to help you change the power of your communications. It’s time for a new script! Learning through Communications. Are you an active listener? Are you a participative communicator? Communication is not a spectator activity. Get involved! You may enjoy it! Planning to Communicate. Communication is not always spontaneous. We can plan and prepare to communicate more effectively in many of the situations we face. Set a goal and communicate to achieve it. Communications – A Success Story. Get the results you want and need! Reduce stress from communications! Celebrate your successes by communicating them to others. You may even talk to yourself.